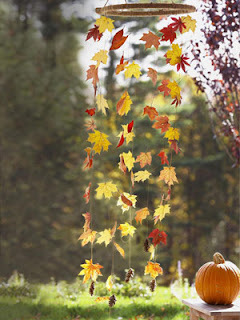 When the kids were little it seemed our house was filled with Autumn decorations. Handmade by small children, it seems they came home with a new craft daily from their respective schools. As they got older and made less school crafts, it was fun to buy decorations to supplement and/or plan our own crafts to do at home. Whether or not you have kids, this is a craft I think would be fun for any age. Plus, it doesn't have that goofy knick-knack feel to it (where you are left wondering where to put something) - it hangs beautifully from anywhere, alleviating the need to find 'another' place on the mantel. This mobile mimics fluttering foliage — minus the raking. Collect leaves with intact stems and press in a heavy book for a few days. Wrap twine or ribbon around an 18-inch embroidery hoop; secure ends with hot glue. Tie eight 3-foot-long waxed strings at even intervals around it, attaching pine cones at the bottoms as weights. Knot the string around each leaf's stem, spacing randomly.